Maggie’s First Dance Free Block of the Month- Block 1 is here!!! I made the sample quilt using machine applique. 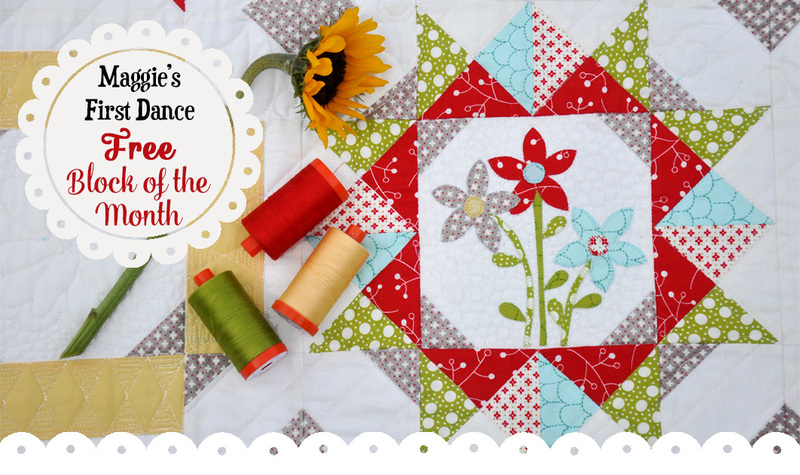 I love machine applique because it’s fast- that means I can get on to my next project! 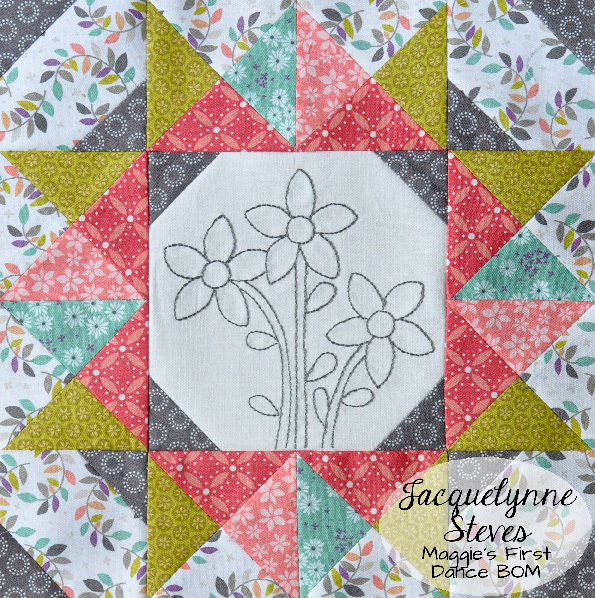 This quilt was made with Hometown Girl fabric by Pat Sloan for Moda Fabrics. I also started working on some embroidered blocks. For these, instead of solid white I used a pretty print with a white background. I also substituted a coral colored fabric for the white/red print, and dark pink for red. I love how it came out! I used 3 strands of Aurifloss #2630 embroidery floss by Aurifil. I also used Lightweight Fusible Interfacing* on the back of my embroidery. I didn’t used to use interfacing on the back of my embroidery, but I like how it gives a little more body to the fabric, and adds an extra layer so any extra threads on the back don’t show through to the front. 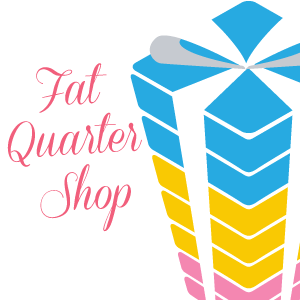 ~~Sew Quilty Friends Facebook Group– we’ve just started a new Facebook group about a week ago and it’s already so much fun :) Lots of quilty chatting going on and new friends being made. 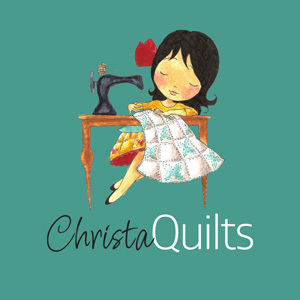 It’s also a great place to ask questions about the BOM, or any quilt related questions. Join here and post your photos. Please visit the featured bloggers to enter the giveaway over on their blogs- that’s 7 chances to win! (There is no giveaway here on my blog, you must visit the blogs below to enter). 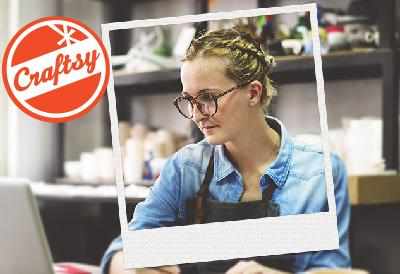 *This page contains affiliate links, which means that if you decide to make a purchase, I will receive a small percentage at no extra cost to you. 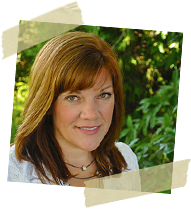 This income helps me to pay for my website, email service for sending out the block patterns, groceries, mortgage…. all that fun stuff! Thanks! 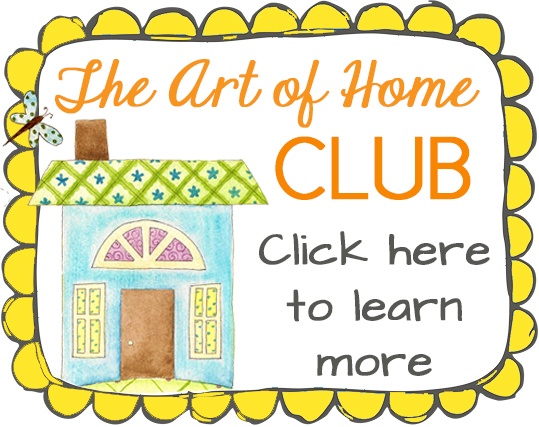 This article was posted in Block of the Month, Blog Hops, Featured, Sewing & Quilting. Bookmark the permalink. Follow comments with the RSS feed for this post.Post a Comment or leave a trackback: Trackback URL. I love the simplicity of the appliques used. I got my email and it’s all printed out…thanks! Yippee!!! First block has arrived. So looking forward to this BOM. Thanks so much for hosting it AND for all the opportunities to win some wonderful products. I love, love, love the background fabric you used for your “white” fabric. Could you tell me the manufacturer and name of that fabric? Hi Dian- it is Wildflowers, 2240205, Alisse Courter, Camelot Fabrics. I love your design. Looking forward to completing it. Yay, we’re beginning! I have loved the blog hop posts I’ve read so far. 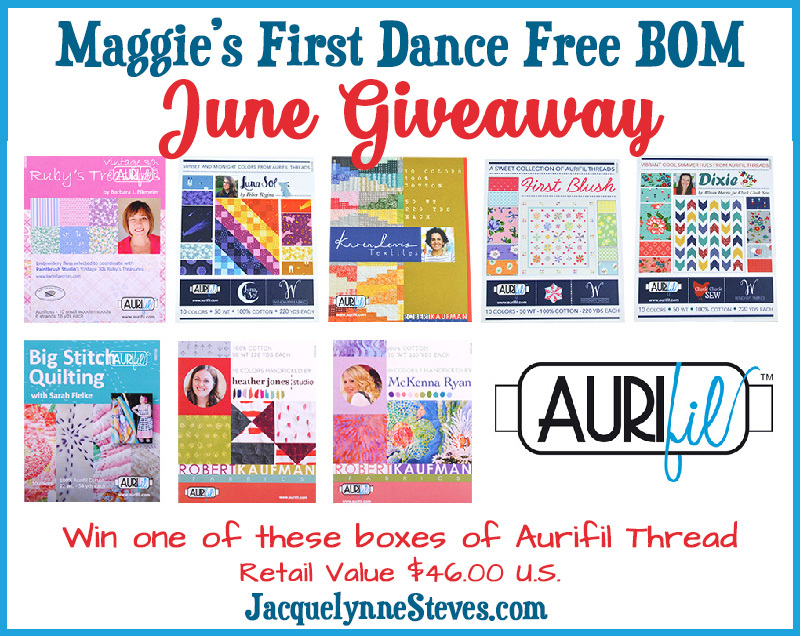 Thanks to you and Aurifil for the giveaway. Who wouldn’t want a box of Aurifil color? Really fun seeing the different choices of fabric being used. I will enjoy choosing my fabrics. Thanks. Thank you very much for this BOM pattern. It looks like fun and inspiring to try new to me techniques. So excited for your BOM! Beautiful! Can’t wait to see the blocks on the other blogs. Thanks for the pattern and great choices for fabric selection. Would love to win the great thread! I have been waiting for this start. Thinking about my color now! I am so glad that Block 1 is here. I cannot wait to get started on this one. I love your fabrics and the added touch of that print by Camelot fabrics. What a great bunch of blogs. Each fun and informative. Also loved seeing the first block in so many different variations. My only problem is now I can’t decide what to do for mine versions. I’ll have to decide this weekend when I begin working on the first beautiful block. Thank you so much! Love the block!! Can’t wait for the next ones. thank you for all your hard work on behalf of us out here in Quilting land. Im looking forward to this project. Thank you for the beautiful block. Looking forward to this quilt-along! Thank you for getting my block to me. I guess I did not see the first email. Can wait to get this started. I really do love these fabrics that you used. It’s a lovely combination. I really do love these fabrics that you’ve used. It’s a lovely combination. Annette- I sent you an email about an hour and a half ago. Did you receive it? Thank you so much! So been looking forward to this. Still haven’t received the M. First Dance pattern ???? 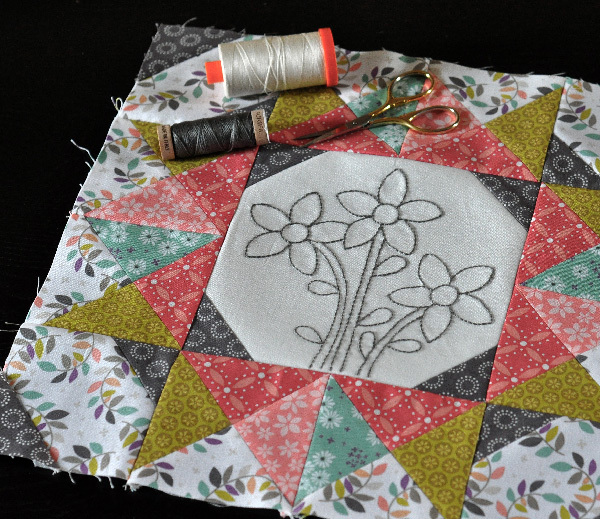 I really enjoyed the pattern and am making dish towels with applique and stitching the quilt block. Just now found this and it is really cute! Wondering how can I get the first two blocks? I missed out on the first dance Block of the month. Can I still get the pdfs for it. 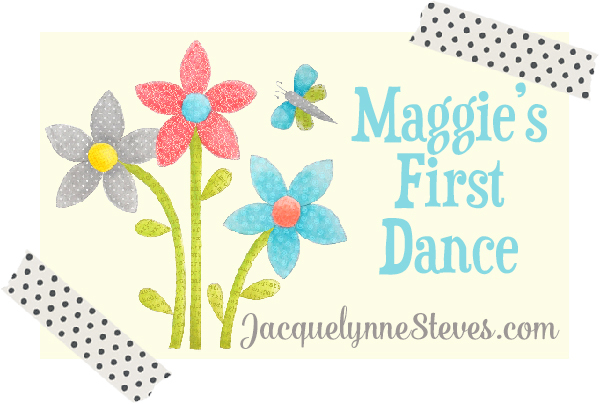 Is it still possible to get the pattern for Maggie’s First Dance BOM? I am new to quilting and just saw it and fell in love.